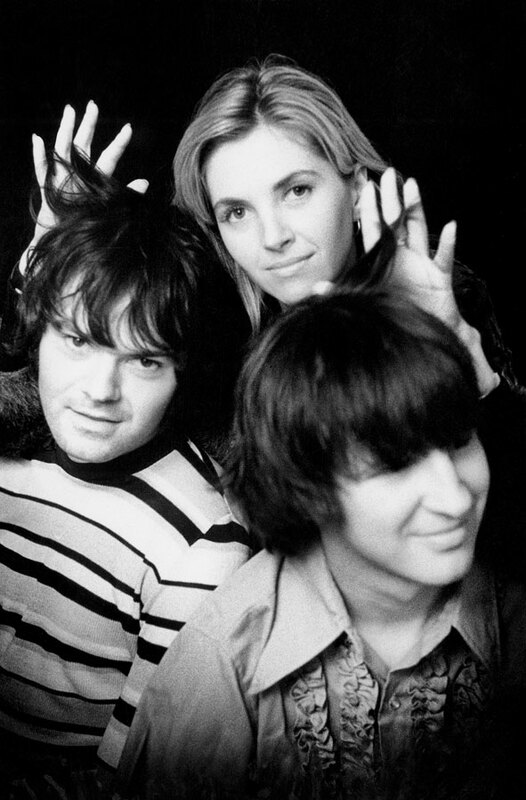 Saint Etienne celebrate a quarter century in pop in a gorgeous new photo book. Polari Magazine talks to the band about collecting the pictures, the appeal of London, and performing for charity as the follow-up act to a bunch of clowns. Saint Etienne and cafés, they just go together, don’t they? Like Lea & Perrins, Highbury & Islington, or Jeff Barry and Ellie Greenwich, the band and cafés have felt inextricably bound together in the imagination ever since their breathtaking second album opened with a tribute to one of Kentish Town’s finest, the elegiac Mario’s Café (“a cigarette, a cup of tea, a bun…”). So it’s fitting that Polari Magazine meets the band on a sunny Friday morning in a shady eatery, tucked away in the maze of streets behind BBC Broadcasting House. We’re here to talk about the launch of a new limited edition photography book, a covetable and really rather gorgeous artefact that takes a chronological journey through (virtually) a quarter of a century of the band’s adventures in pop. In it, Sarah Cracknell, Bob Stanley and Pete Wiggs – Britain’s best pop band of the last two decades, lest we forget – transform from wide-eyed cultural magpies to sophisticated custodians of all that’s still thrilling and vital about pop music. From Paris to Berlin to Malmö, Dublin, Brighton and Norway there’s the element of pop globetrotting you’d expect from an internationally recognised band, but what is striking is just how much the book feels like a kind of story of London too – with locations across the city as various as Holland Park, Hampstead Heath, Piccadilly Circus, Leather Lane and even London Zoo, to the penultimate shot of the three members on the balcony of the Royal Festival Hall. So, how did you get involved with the project and publishers First Third? Bob: It was all very natural, really – I suppose we knew a lot of people involved with the publishers, like Fabrice (Couillerot) who put it together and Lora (Findlay) who did the design. Lora we’d worked with before on Tales From Turnpike House. She designed the cover for that. And where did you start with 20 years worth of pictures? Sarah: I had a box somewhere – a number of boxes actually – and I just started going through them. I mean, there were tonnes, whole packets of photographs which I went through – like five packets just to get that one picture. And Martin (Kelly – the band’s manager, record label boss and Mr Sarah Cracknell) had a great big box of the press pics. Bob: And some of the press libraries we had access to, so we went through all of those. Was it quite emotional looking back? (Intrigued) What happened at Chessington? Was it a gig? Pete: Er, kind of, yeah! A charity thing. Sarah: We were on after some clowns. Some clowns doing songs from Grease I think. And then it just went from bad to worse. Everyone left! As soon as the clowns finished everyone left. Pete: It was meant to be a fun day, a fundraiser. I remember they got really angry with us because they thought we were going to bring loads of people with us who had loads of money. Sarah: A coach load of fans. Sarah: It was ’94. Bob wasn’t there … Lucky Bob! That’s what happens when you do things for charity! 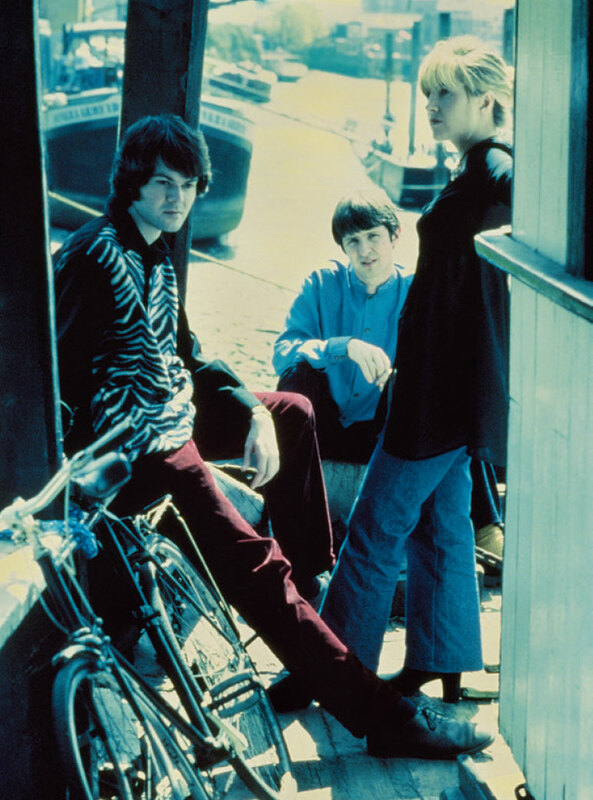 One thing we loved about the book was the outfits – how the fashions and styles change but it’s still always Saint Etienne. Sarah: Funnily enough I think that the clothes I was wearing were one of the things that I remembered most. I’ve still got a lot of the clothes … in another box. Pete: My clothes start to fit a bit better as the book goes on. We had slightly more money and I could buy clothes that actually fitted me. Did you ever employ a stylist? Sarah: A couple of times. For my solo record (1996’s Lipslide) they got me a stylist and she got paid a fortune – something like 600 quid – to take me into shops where I chose what I wanted and she just paid for it. I thought, “I could do that!”. And we did have a really nice guy once who got some really nice suits for us. Pete: We used to hate it when people brought along clothes for us to wear. Bob: Mmm. Until we realised we could just pick our own clothes. Pete: I remember the stylists used to come and put hair gel on us. Bob: We did those photos for Elle – remember those? And we were wearing quite good clothes and we were quite pleased with it but they’d given all our faces a green tinge. Funnily enough, they didn’t make it into the book! Sarah: I wouldn’t go that far, but I did quite like the gold cat suit in the ‘Pale Movie’ video. I found that in a market somewhere. It was really cheap – like a fiver or something. Bob: There was a stylist we had who was really good – Mark Anthony. He was great. He really knew what we’d look good in. I felt like I was in The Ipcress File the way he dressed me. It was around the Good Humor time. I ended up buying most of the clothes he chose for me. Pete: And quite early on we got some money to buy some Paul Smith suits, didn’t we? And some shirts. That was the picture with the mirror. I love those shots. They were from 1994, for Select magazine, weren’t they? Pete: He asked us all out! Bob: But I really love those photos he took. How long did they take? An average photo session? Sarah: It really depended on how many costume changes there were. The Pierre et Gilles shoot with Etienne Daho was hilarious – a whole day of make-up and all for one set-up, wasn’t it? It took twenty-four hours and they just did one shot – all day preparing for that one shot. Looking through the book it feels like London has always been pretty key to your story. 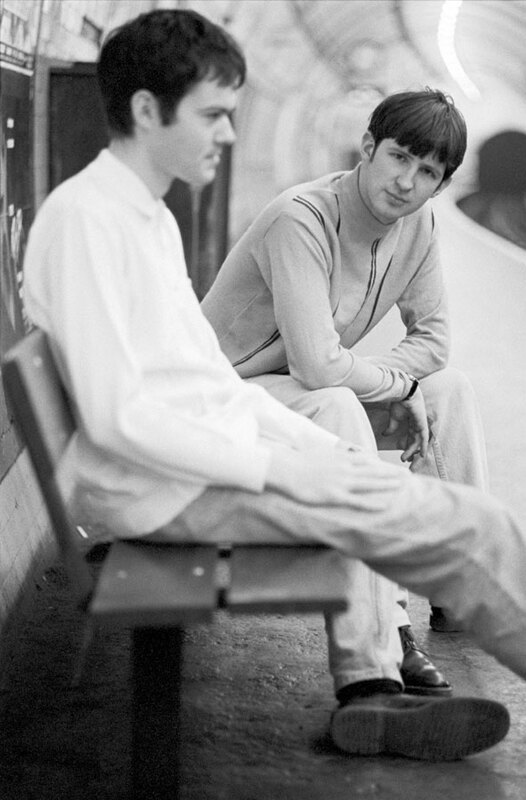 What made for a good Saint Etienne London location? Sarah: Yeah the Zoo was quite depressing in those days. And I was a vegetarian. Pete: The old days … of performing bears! Bob: And Leather Lane, I suppose, that was where the Creation and Heavenly offices were. Quite often the location would be down to circumstance. And there was more exciting stuff going on in odd bits of London back then. It wasn’t all concentrated in the east. Does London still matter to you so much? Sarah: Yeah, oh yes. I’ve moved out of London but that’s purely about needing more space for family and stuff. What’s your favourite shot in the book? Sarah: I really do love the ones in Berlin, the bowling pictures. There’s something about the colours in them. Pete: And we’re not posing. They’re really natural. 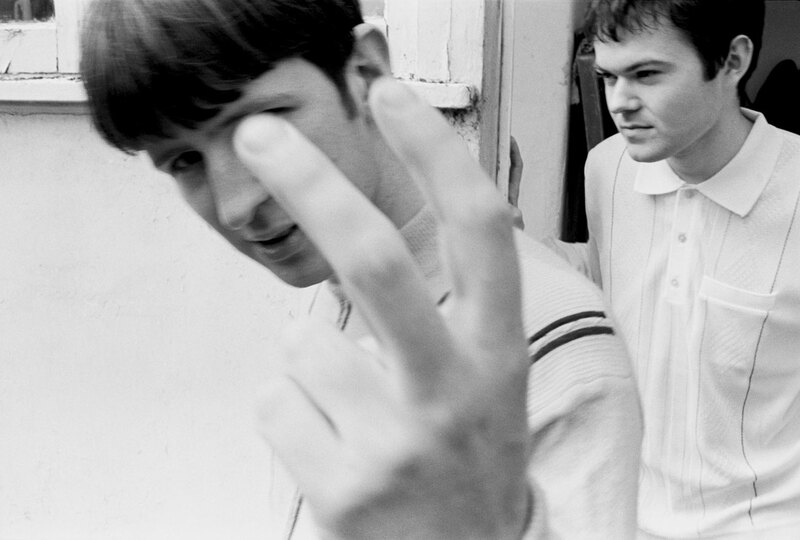 Pete: I really do like – though Sarah’s not in it – the V-Sign picture in Tufnell Park, just because we look so young in it and it reminds me of just starting out. And on that note we’re out of time. The Gaggia hisses again and the PR taps his watch again to signal it’s time to deliver the band to the BBC round the corner, where they’ll be interviewed for 6 Music. Later that night Pete and Bob will DJ on the concourse of the newly relocated Foyle’s bookstore and the band will attend a screening of How We Used To Live, their new cinematic collaboration with Paul Kelly. Meanwhile I make my way to the Tube, clutching a now-signed copy of the book – “With lots of love from ‘The Et’”. Swoon. Saint Etienne is available from First Third now.